All pet parents have experienced a stubborn refusing to eat at some point or another. 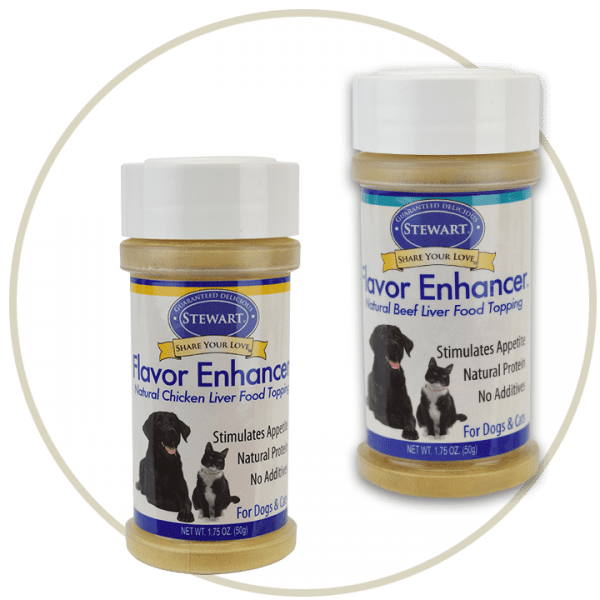 Stewart Flavor Enhancer for Dogs and Cats are made to help entice your pet to eat. Cats and dogs can refuse to eat for many reasons like stress, traveling, medication, or even switching foods. Sprinkle a little flavor enhancer on top of your dog or cat’s meal and watch them dig in. Stewart Flavor Enhancer was made to help entice your pet to eat. Made with 100% pure beef liver or 100% pure chicken liver, and no artificial preservatives, your pet will be begging for food in not time. Shake over food and mix, 1/2 teaspoon for every 10 pounds of weight.